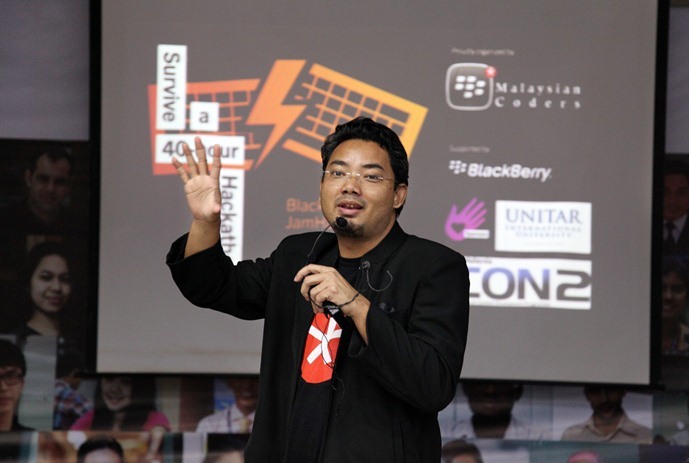 BlackBerry’s latest endeavour to entice developers to its BlackBerry 10 platform is the JamHack 2012 event, which is a simultaneous region-wide, 40-hour hackathon. The Malaysian leg of the event happened last Friday, with the winners – Team Websmith ATP – to represent Malaysia in the BlackBerry JamHack Asia in Bangkok next month. With twelve teams participating in the event held at the University of Management and Technology in Petaling Jaya, each team were given 40 hours to conceptualize and build a working application for the BB10 platform, utilising frameworks such as the BB10 Adobe AIR SDK, BB10 Native SDK and BB10 WebWorks SDK. Team Websmith ATP’s winning pitch was to implement augmented reality in their application, called 1BB. The application lists out the Kedai Runcit 1Malaysia and Klinik 1Malaysia around the country, and provides details such as address, opening hours and contact details. It also utilises GPS to lock down the user’s location, and then implements augmented reality technology that lets users located the 1Malaysia outlets around them via the device’s camera. The runners up, Highlight, produced a location-centric social events listing application, which pulls local events in the user’s surrounding area from the web. It also allows for easy sharing of these events via BBM. As champions, Team Websmith ATP won an all-expense paid trip to the BlackBerry Jam Asia in Bangkok, where they will be vying with nine other teams to be crowned Asia Pacific champions.